A game of Environmental Knowledge with questions for four different grade levels: Early Elementary (K-2), Upper Elementary (3-5), Middle School (6-8) and High School/Adult (9-12 and beyond). With the support from the Wrigley Company Foundation, Keep America Beautiful completed a two-year process to transform its Waste in Place resource guide, which includes over 100 activities for pre-K to sixth-grade students. The Waste in Place kit includes multi-dimensional educational programs that encompass activities for classroom learning, as well as children's books, a board and card games, and story cards. The materials are used nationwide by thousands of teachers to influence positive behavior, to foster social responsibility and respect for the environment, and to enrich their students’ learning experiences. Check out the latest educational game from NASA’s Climate Kids—OFFSET! Take matters into your own hands and help cut back on carbon emissions. Part pong, part resource-management, and 100% retro, this game is challenging, exciting, and educational. The Quest for Less: Activities and Resources - incorporates a range of activities related to waste reduction and recycling into various subject areas throughout the school year. Recycle City is an interactive game where visitors to the virtual town find out what citizens are doing right to save resources, energy and water...and what nearby Dumptown is doing wrong. Basic Facts about Waste covers the basics about the trash we throw away everyday and what you can do to help. Learn how your choices can reduce waste in your home, your school and your community through EPA's Make a Difference Campaign. Resources for Waste Education - offers several activities that make learning about recycling fun! For students looking for homework research or special project ideas, Homework Resources is the website for you! For more project ideas, activities, and games about solid waste, recycling and the environment, click on the button below. A new Earth Day resource for Middle school teachers here. 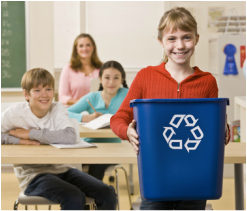 How to Start a School Recycling Program! ​Climate Bingo! Now available at NASA's Climate Kids! Climate Bingo! Spice up your next car ride or bus trip! In this game you will be on the lookout for things that are good for our climate and environment and things for things that can sometimes hurt them. Our bingo generator creates a unique card for each player. You can learn all about the different items on our website: http://climatekids.nasa.gov/bingo. SciJinks has received a complete digital makeover! With new ways to search for, view, and share content, learning all about weather, Earth science, and satellite meteorology has never been easier or more fun. Be sure to check out the new look at http://scijinks.gov. Did you know that some satellites keep an eye on space weather? When you think of a weather satellite, you probably think of something in space keeping watch over clouds on the ground. But some satellites also keep an eye on a very different kind of weather—space weather! Learn all about it in SciJinks’ very first “SciJinks in a Snap” video—a new series of short animated videos with accompanying posters that are as entertaining as they are educational. Check it out at http://scijinks.gov/space-weather-snap. Students learning about the environment at a young age leads them to have a more sustainable lifestyle in the future. Listed below are great lesson plans about the environment geared to middle school students. TeAchnology is a membership organization that has tens of thousands of resources for teachers, including lesson plans on waste reduction, recycling and sustainability. Middle School Recycling Projects and Classroom Recycling Conversations are from the eHow blog and contain a number of cool projects targeting middle school students. Take a virtual recycling tour! Have you ever wondered what happens with materials that are put into the recycling bin? ReCommunity provides resources for recycling education including how materials collected at the curb are sorted at a materials processing facility and remade into new products. ReCommunity - How Recycling Works from ReCommunity Recycling on Vimeo.